I have always envied Dorothy Harley Eber. Two decades ago my soon-to-be editor kindly invited me to lunch to discuss my unpublished manuscript. A charming lady named Dorothy who had a similar interest in Inuit oral history accompanied her. At that time Dorothy, unknown to me, was already famous for her groundbreaking Pitseolak: Pictures Out of My Life. That book was an illustrated oral biography of the Inuit artist Pitseolak Ashoona created from recorded interviews Dorothy had undertaken in 1970. She had recently completed another biography based on interviews with Peter Pitseolak eventually published as the excellent People from Our Side. Whereas I mined dusty and obscure sources for Inuit testimony collected during the nineteenth century, Dorothy actually met with living Inuit and over the years had patiently developed a trust and rapport that allowed her to record and preserve a fast-fading culture. We shared a belief in the value of the Inuit oral tradition, both in itself and as a cross-cultural window into historical events. Dorothy had notably pursued this second avenue with her When the Whalers Were Up North: Inuit Memories from the Eastern Arctic (1989), her first foray into contact between the Inuit and Europeans. We had a delightful lunch, and I remember asking Dorothy whether there were any modern memories of the Franklin disaster (my own area of interest) among her informants. In this book, finally, and much to my delight, Dorothy has answered that question. Eber is fully forthright about the difficulties involved in the use of Inuit oral history. Tommy Anguttitauruq tells her, “every time the stories are told, maybe they'r [sic] a little bit different; there's a little bit added and maybe some things left out” and she notes that the stories “are sometimes blended or “collapsed” … [t]hese stories are now getting through to the next generation only in a fragmented state.” Even so, as the narrative makes clear, these relics of old traditions often complement the preserved stories of the great-great-grandparents of Eber’s informants. Whether these correlations are confirmation or repetition is more difficult to determine. The stories themselves preserve Inuit traditions ranging in date from the expeditions of Martin Frobisher (1575-78), to the successful accomplishment of the Northwest Passage by Amundsen in 1903. As the theme of the work is to show the reliability of transmitted oral tradition it is not perhaps surprising to see that there is nothing particularly new in most of the stories, which are often rather pale reiterations of traditions originally relayed, mainly in the nineteenth century, to Rae, McClintock, Hall and Schwatka. The best test for the accuracy and resiliency of Inuit testimony comes from extended interactions during Sir William Edward Parry's 1821-23 sojourn at Igloolik, and Sir John Ross’ voyage to Lord Mayor Bay between 1830-34. These well-documented expeditions allow Eber to usefully compare modern remembrances with the journals of the explorers themselves. Eber relays various versions of the most colourful intercultural incidents of these interactions. Given prominence of place is the punishment meted out by Parry to a local shaman for stealing a shovel and the shaman’s supernatural revenge. The stories of Ross’ visit include the initial discovery of his ship in the ice and subsequent deliberations among the Inuit, and various tales of the repeated visits of the Inuit to his vessel. Here the interest lies not so much in the content of the modern recollections, but in noting how these have been filtered and modified by the passage of over a century and a half. Some of the modern Inuit stories also contribute to exploration history by dealing with matters unknown to the explorers themselves, such as the final resting place of Ross’ abandoned Victory, or the use made by the Inuit of his “treasure trove” of abandoned equipment. The modern stories are best at relaying charming cross-cultural vignettes of a hunter so afraid of a strange ship that he ran so fast that his caribou coat trailed behind him in the wind, of a girl using tobacco blocks as toys, or of children throwing flour into the air as "smoke" having no idea of its food value. These opening chapters lead to the core of the book, the stories relating to the Third Franklin expedition (1845-?). Comprising almost half of the book, the next three chapters deal with this doomed expedition and the Inuit remembrances of it. The chapters revolve around three of the pivotal questions of the disaster - the burial of a “shaman” or officer, encounters of Franklin’s doomed men on the march, and the location of the wreck(s) of the expedition vessels. The remembrances concerning the burial of an officer again follow closely on other recorded testimony, particularly that known as the “Bayne story” which Eber surprisingly buries in a long endnote. Presumably dealing with the burial of a senior officer (usually assumed to be Franklin himself) and, more significantly, with the nearby burial or deposition of written records, the modern physical description of the site “a sandy hill” matches that of Bayne, although the exact location remains frustratingly vague. The stories of encounters with Franklin survivors on the march are given in three versions, all located in different but uncertain areas. Two of these deal with Franklin crewmen wandering into a camp, one told from the perspective of the women, and one from that of the hunters who returned to find that strangers had come to visit. Even the Inuit are unsure whether these traditions “might be the same story ... but passed on through a different family in a different manner.” These stories do not have much in common with the testimony preserved by Hall, Schwatka and Rasmussen about an encounter between hunters and struggling men in Washington Bay, but there are enough common elements (being offered a small piece of seal, the abandonment of the Europeans after one night etc.) to make one wonder whether these are indeed new stories. The first deals with the discovery by Inuit of a ship to the east of the Royal Geographical Society Islands, and of a presumed Franklin campsite ashore. Although the story adds detail, this again is not entirely new information as Amundsen was told of a ship having been seen here (Eber notes this herself, but not until 10 pages later). The traditions that tell of visits to this ship and interactions with its crew are also in accordance with older stories about pre-abandonment encounters between the Franklin expedition and Inuit and, from the location, tend to validate the hypothesis that at least one ship (only one is mentioned) was remanned after the initial 1848 abandonment. The “fireplace trail” stories also tend to reinforce this idea as they deal with a sequence of encampments found around the western and northern coasts of the Adelaide Peninsula. These seem to mark a party retreating from the ship spoken of as having been abandoned near O’Reilly Island. The first find was at “Aveomavik” a small island off Grant Point, where Michael Angottitauruq found a non-Inuit campsite and bones of three individuals in 1984. The discovery of campsites and human remains on a small islet nearby in 1997, 2002, and 2004 lends support to this story. Other locations on the “trail” recollect finds from the nineteenth century at Thunder Cove and northwest of Starvation Cove. This detailed description further calls into doubt the opinion of most commentators (uncritically accepted by Eber) that this deposit was formed from cases of dog food thrown overboard by Amundsen while the Gjoa was enmeshed in the Matty Island shoals. Both the Burwash account of carefully stacked cases inshore, and this new story of a carefully buried cache, imply stores left deliberately and point to the Franklin expedition. This does not necessarily support the idea of a wrecked vessel nearby, which has been repeatedly searched for in vain, for a cache here could have been established to support survey or possible retreat parties. The book ends with chapters of Inuit stories about the Collinson expedition sent in search of Franklin and of remembrances of Amundsen’s Northwest Passage triumph. 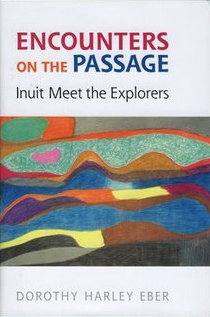 Again these stories are interesting windows into the Inuit perception of the visits of these strangers but offer little new information of significance to historians. The publisher’s claim that “new information opens another chapter in our understanding” of the events of these expeditions, especially the Franklin disaster, is perhaps overstated. A close reading shows that there is actually very little new information presented, and that where there is it tends to, at best, confirm earlier evidence. Overall, the book is a very worthy contribution to the store of preserved Inuit oral traditions. It serves as a useful reference and introduction to the stories relating to explorers that are otherwise scattered throughout the literature on British Arctic exploration, and sets them in a clear context. Those who are already familiar with the traditions will enjoy tracing the genealogies of the modern remembrances; others will be interested in the effect of time on changing the original versions. To her credit Eber only rarely gets caught up in the intricacies of historical speculation and primarily stays with her strength – the reporting and preservation of the stories themselves. This is a task she was seemingly born to do, and once again we are indebted for her painstaking labours.